Democratic Gov. Tony Evers was sworn into office Monday afternoon as Wisconsin’s 46th governor. Evers, 67, will helm a state government divided along party lines, with Democrats in every executive office and Republicans controlling both houses of the state Legislature. 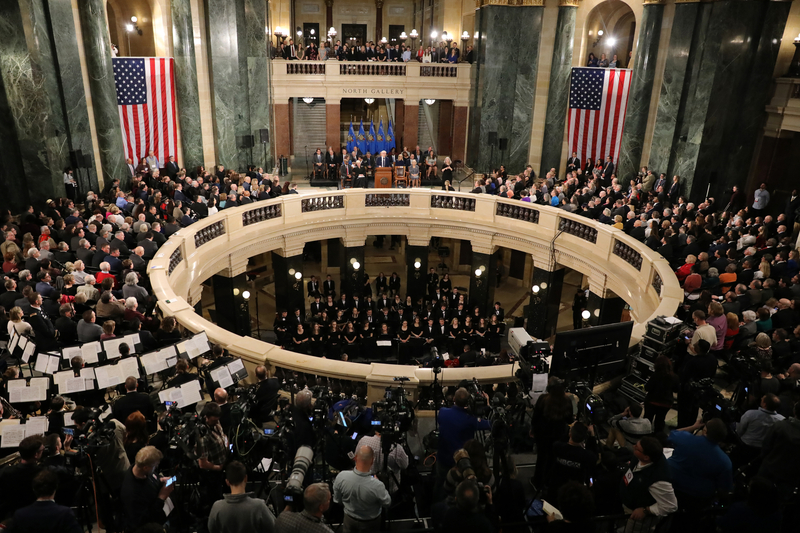 In his inaugural address, Evers called for bipartisan cooperation at the Capitol. "We’ve gotten away from who we are and the values that make Wisconsin great — not Republican or Democratic values, but our Wisconsin values of kindness and respect, empathy and compassion, and integrity and civility," he said. "This is bigger than me; this is about the people of Wisconsin. It’s about setting aside political interests and personal ambitions to work together on solving problems." Republicans will hold a 63-36 majority in the Assembly and a 19-14 majority in the Senate. The new class of lawmakers will also be sworn in Monday. Evers, the former state schools superintendent who defeated a sizable field of Democratic candidates to win his party's nomination , has spoken extensively about bipartisan cooperation since his election. However, Republican lawmakers approved a package of bills late last year limiting Evers' power to do a number of things , including fulfilling a campaign promise to end Wisconsin's involvement in a lawsuit challenging the federal Affordable Care Act. GOP supporters of those new laws say they will ensure an appropriate balance of power in state government. They point out Evers will have one of the most powerful veto pens in the country, as Wisconsin's governor may issue line item vetoes of spending bills. 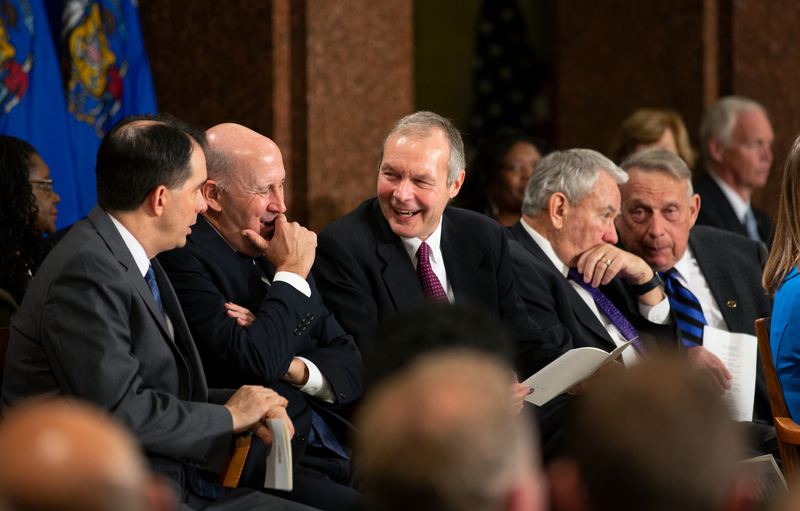 In his address, Evers echoed familiar themes from his campaign: increasing K-12 education funding, improving health care coverage and finding a solution to Wisconsin’s transportation funding debate. He said he will "put people first," highlighting individuals like "kids across our state going to school in classrooms with thirty other kids because we’ve failed to fully fund our public schools" and seniors who can’t afford rising prescription drug costs. Evers also revisited a pledge to ensure health insurance coverage for people with pre-existing conditions in Wisconsin. He said he will also work to help graduates struggling with student loan debt and address rising child care costs, gun violence and climate change in the state. "We have significant challenges facing our state, and we will no doubt face setbacks in the days ahead," Evers said. "But we are more than the sum of our differences." Before a crowd of hundreds, Democrats were also sworn into the offices of lieutenant governor, attorney general, secretary of state and treasurer. Lt. Gov. 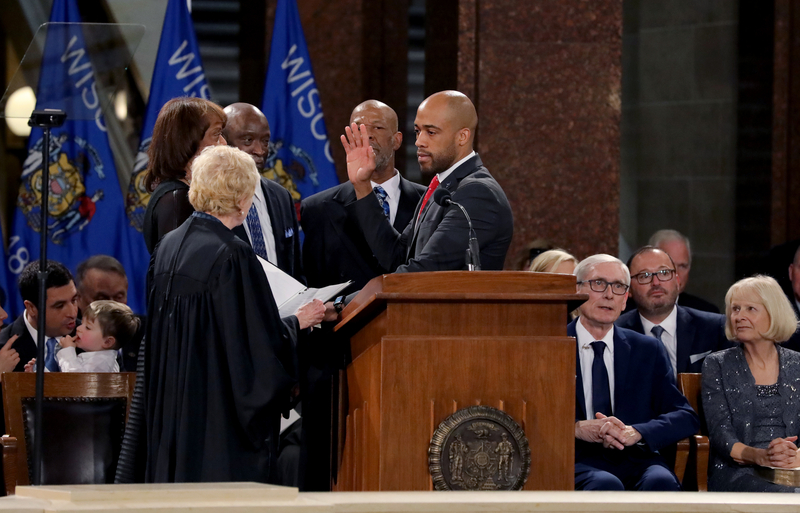 Mandela Barnes was sworn in as the first African-American lieutenant governor in the state’s history. "The gravity of this moment is not lost on me as we strive for equity," Barnes said. Barnes, who served as a state lawmaker in the Assembly from 2013-2017, said he intends to focus on equity and sustainability as lieutenant governor. "A person’s zip code should never determine their destiny in the state of Wisconsin," he said. 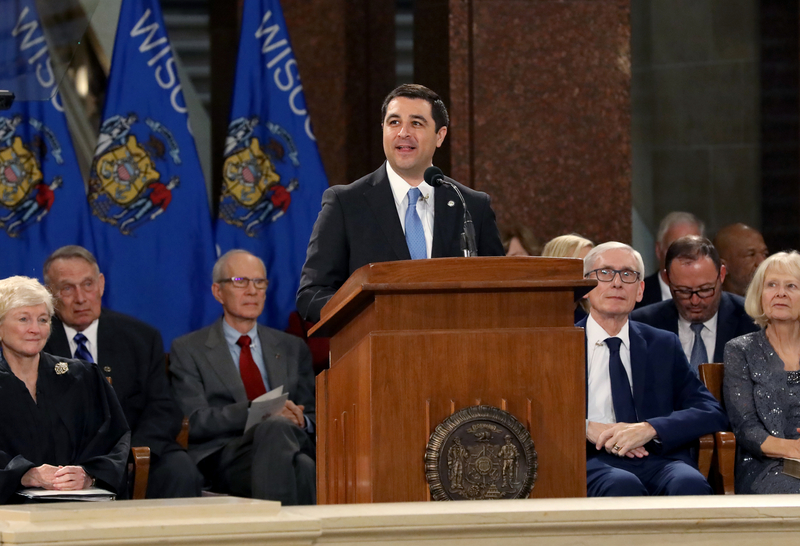 In his inaugural address, Attorney General Josh Kaul criticized the GOP-backed bills passed during the recent lame duck session. Those new laws limit the powers of his office, as well as the governor. Those limitations include a new requirement for lawmakers to approve state lawsuits challenging federal policies. "Irrespective of the actions taken by the lame-duck Legislature, the priorities of the Wisconsin Department of Justice are changing," Kaul said. "We will stand up to the federal government when we need to do so to protect Wisconsinites." Kaul also said he will champion universal background checks for gun sales in Wisconsin and a so-called "red flag law," which would allow family members to ask a court to order the removal of an individual’s firearms if they believe that person to be dangerous to him or herself or others. Secretary of State Doug LaFollette, who was sworn into his 11th term in the office, called for a return to Wisconsin’s progressive roots. Treasurer Sarah Godlewski, who takes office shortly after the office itself was up for elimination, said she will work as the state’s fiscal watchdog and to "turn the page on the neglect of this office." Several former governors attended the inauguration ceremony, including former Gov. Scott Walker, who occupied the governor's office since 2011 and became a rising star in the national Republican party. Walker has said he would consider running for public office again . The next major milestone for the Evers administration will be the new governor’s budget address, which is expected sometime in next few months. Editor's Note: This story has been updated with original reporting by WPR.